Kourtney Kardashian has always struck me as one of the sanest Kardashian family members, barring the younger siblings, and this proves it. When everyone else in the family has been jumping up and down with joy [figuratively] over news that Kanye West cheated on Kim Kardashian, Kourtney’s actually telling her sister to break up with Kanye. Why would she do that? Well, because she actually cares about her sister’s well-being and doesn’t want her to stay with a guy never makes time for her, and possibly cheated on her with someone named Leyla Ghobadi. Even if he proves that he hasn’t cheated on her, he hasn’t really been a good boyfriend, has he? Either way, while Kris Jenner and Khloe Kardashian figure out how to stretch out this drama for as long as it can possibly go, Kourtney’s telling Kim to dump the Yeezus. A large part of Kourtney’s decision could come from empathy after dealing with her own relationship issues with Scott Disick. However, by that logic, Khloe should also support Kim after dealing with Lamar Odom’s rumored infidelities. Either way, if Kim stays with Kanye, it’s good for publicity, and if she breaks up with Kanye, it’s good for publicity. The difference is – if Kim breaks up with Kanye, there will be an end to the publicity. Sure, the Kardashians will always manage to drum up drama, but when has their name so ubiquitously been in the media than the duration of Kim’s relationship with Kanye and their ensuing pregnancy? Exactly. 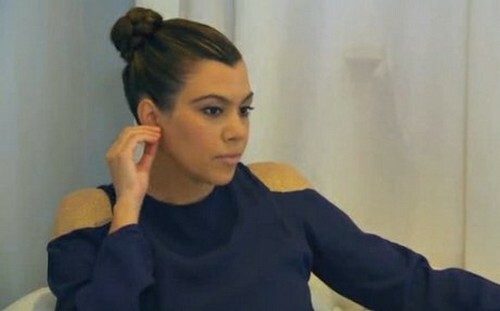 So should Kim listen to Kourtney and dump Kanye? There are people saying Kim should break up with him, and there are others saying she shouldn’t. Let us know what you think in the comments.